Cod breakage may occur in all bentonite-bonded sand molds, regardless of their basic mold material, the casting material and the casting method. These defects are observed mainly with very large cods, unfavorable depth-width ratios, and in over-compacted mold materials. The influence of the molding process and/or the molding machinery is critical in this context. 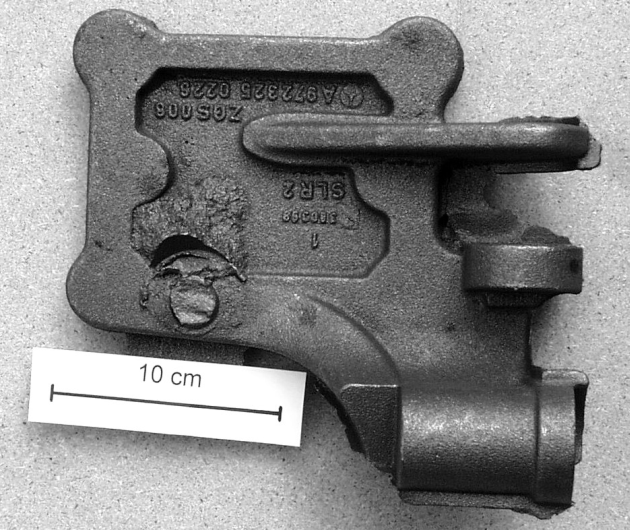 Often complete inclusions of a broken mold part are found in the casting in form of a solid, flash-like metal hump of irregular and uneven appearance. The intended opening that was pre-molded by the cod, is completely filled and closed by the metal (Figures 1 and 2). Naturally, this is a defect that is visible to the unaided eye and causes reject of the casting. Cod breakage occurs in situations where the mold-pattern adhesion of the cod is higher than its tensile strength. Moreover, in case of insufficient plasticity of the mold material, cod breakage may occur during molding, closing of the mold and when inserting the core. Particularly when lifting the mold off the pattern equipment, cod breakage that is not visible to the eye may occur in case of inappropriate plastic properties of the mold material and/or in case of defective, e.g. uneven lift-off of the mold part and consequently excessive tilting moments in the cod. The cracked or broken area cannot withstand the casting pressure and casting temperature and is flushed into the mold cavity. Another influence originates from the flowability of the mold material during filling of the box parts. 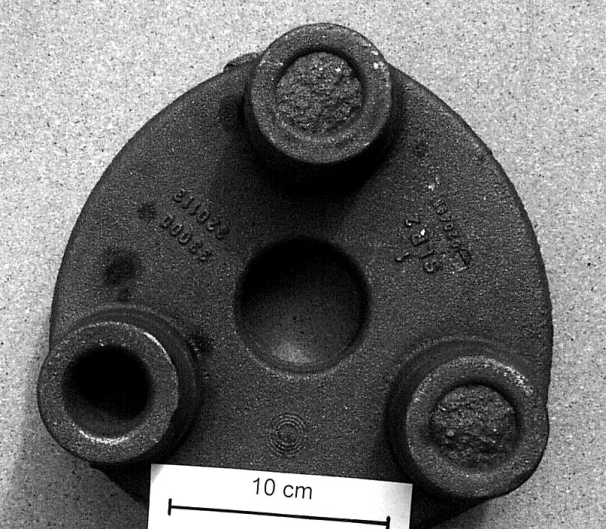 Poor flowability, which in this scenario is considered equal to poor filling of the mold box, and the inevitably resulting unevenness in compaction may have an extremely negative effect on the defect. 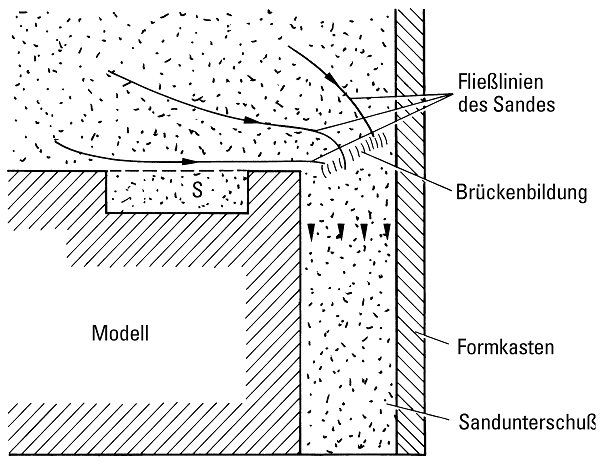 In this way, sand deficiency may occur as a consequence of poor flowability (Fig. 3). Due to the sand deficiency, flow movement of the sand is initiated during the last phase of compaction (illustrated by the schematic diagram in Fig. 3, see flow lines) and this flow movement causes shear stresses and shear failure in cross section S parallel to the pattern surface. The sand cod will break off during demolding. Increasing compaction of the mold material also causes problems during separation of the pattern from the mold. The more or less embedded mold parts are tightly encased in the patterns or between the pattern and the boss wall. These separating forces are substantial and present particularly high demands with regard to mechanical properties of the mold material during separation; the sand ought to have particularly high tensile strength to allow for drawing of the encased mold cod. Moreover, if the pattern is not separated from the mold by pulling in a parallel movement (Fig. 4), this process also represents a challenge for the plasticity of the mold material. In practice, the risk of tilting during separation of the pattern from the mold may occur as a consequence of guide clearance of the mold box bushes / mold box pins, incorrect machine settings, and mold box modifications. Improvement of the tilt angle (at a specified density) is achieved by measures that increase plasticity of the sand, e.g. through increase of the bentonite and moisture contents. Notwithstanding that, it must always be taken into account that increasing moisture impairs flowability of the mold material. Hence, increase in bentonite is preferred over increase in moisture for improvement of separating properties. This also is one of the reasons for the trend during recent years and predominantly since the application of molding plants with higher compaction intensities, of using mold sands with higher bentonite contents. Another major advantage of higher bentonite contents is sufficient plasticity of the sand at relatively low water contents. However, optimum conditioning of the mold material is an absolute prerequisite. Drawing of relatively high sand cods is possible due to the comparatively higher tensile strength as seen in relation to the adhesion forces developed. With increasing compaction, adhesion force undergoes greater rise than tensile strength, so that the tendency for mold breakage becomes greater with increasing compaction pressure. Since applied pressure is mostly adjusted to mold parts with low density, ensuring optimum sand distribution within the mold is essential in order to avoid excessive pressure. Utilization of separating agents must be ensured in any case; the types of separating agents used must contain lubricants for limiting friction forces at the pattern-mold separating surface to a minimum. Hot sand increases adhesion tendency an thus occurrence of mold breakage. 1. Aim at optimum mold material conditioning, i.e. best possible dispersion (decomposition) of bentonite with as low a water content as possible. 3. Optimize plasticity properties of the mold material. 4. Use bentonite with as high a montmorillonite content as possible. 5. With cast iron materials, increase the addition of carbonaceous products as necessary. 6. Use separating agents for minimization of pattern-mold adhesion. 7. Ensure even distribution of mold material in the mold box. 8. Check the applied pressure of the molding plant and reduce as necessary; above all, avoid excessive locally applied pressure. 9. Check the mold for lift-off behavior and correct if required (lift off in a parallel movement). 10. In single-piece production of large, hanging cods, use lifters.